Product Detail Summary: This iconic roleplay replica of Ignitor's Flame Sword is nearly 24 inches long! Become your favorite Skylanders Giants™ hero by wielding the mighty Ignitor’s Flame Sword by Mega! 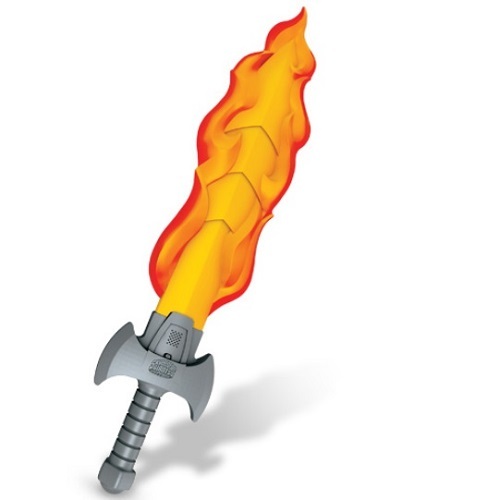 Put yourself in Ignitor’s fiery boots and defend Skylands from the forces of Kaos with this detailed replica of his flaming sword. Unleash three authentic sounds from the Skylanders Giants™ video game as you slash and burn evil minions just like Ignitor! Sword is made of toughened rubber/plastic- as with all roleplay toys, adult supervision is still suggested.